With so many products these days coming out of China, it was a surprise to get the commission for the supply of a new main mast for the 53ft ‘Wing Sing’, a replica Chinese Sailing Junk. Designed on the traditional boats that were once common sight in the old harbours of Hong Kong, the 3 masts and tan coloured junk sails look like a step back in time. 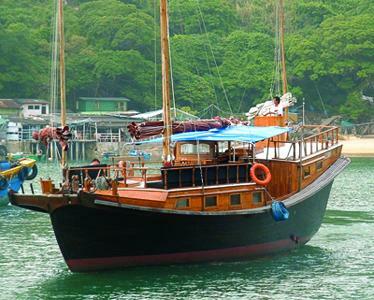 Privately owned yet used for corporate occasions and charter, Wing Sing, was currently in the final stage of a complete re-fit in Hong Kong, when serious rot was discovered in the main mast making a replacement the only practical option. At 47’ overall and 9” in diameter producing a replica spar presented no foreseeable problem, but getting it to Hong Kong however was going to be more of a challenge. Looking at a container for shipping, it was soon established that the common 45’ container has an internal maximum length of 44’5-5/8”. Although a little extra length could be obtained by positioning the spar diagonally, it still was not quite enough to feasibly make it fit. Therefore an alternative solution had to be found, and the focus was then moved to the top of the spar. Although in the past Junk rigs were commonly unstayed, Wing Sing had been fitted with shrouds that were taken to the main halyard band at 44’ above base. With the top 3’ of the spar only supporting a service sheave and provisions for the burgee, it was decided to make this part removable in order that it could be shipped at 44’ with the final 3’ attached once safely in Hong Kong. a traditional varnish simply wouldn’t last. After consultation with Marineware in Southampton, eight coats of SP Eposeal was applied to fully saturate and coat the surface timber, and after leaving the spar outside for 10 days to allow full cure and for all the solvents to disperse, 4 coats of Epifanes PU was applied over the top. This way, should the exterior 2 pack varnish be damaged, the Eposeal will protect the spar from blackening due to the deep penetration into the surface of the wood fibres. Having used the system in the past on XOD masts, even with complete lack of care the spars continue to look like new after a number of seasons use. With the varnish complete, container booked and packing about to start, a call from the owner informed us that they forgot to specify the mast needed to be stained to match the colour of the other spars on board. Very apologetic it was requested we removed all the layers of varnish that had just been beautifully applied and then stain the spar to match a sample, which was speedily Fedexed to us. Before reapplying the complete varnish system all over again. A costly mistake, but at the end of the day a satisfied customer who I’m sure in future will remember to ask his wife’s opinion on the colour of all new purchases from now on.